At the end of this year, Perth will welcome one of the world's greatest living pop icons. Elton John and his band will be on their 15th Tour around Australia. Elton John began his career in the 1960's and has now become one of the world's greatest icons. Many of us know his songs through Walt Disney movies we used to watch as kids, whereas some people have just seen him thrive throughout the year, into a successful musician. His latest contribution to animated films was no later than this year's latest Touchstone Pictures animation, Gnomeo & Juliet. This just takes me back to when I was a child and watching The Lion King, over and over again, crying every time Mufasa dies. I'm sure a lot of you feel the same way. If I ever hear "Can you feel the love tonight?" I immidiatlely think of Elton John and The Lion King. Since his debut in the 60's, he has won Grammy and Oscar awards and sold over 250 million albums, making him the most successful artist of all time. Every album has always been unique and had a different genre. From classic, country, soul and disco to gospel and rock, he has shown everything to his fans, but he still has more to come. 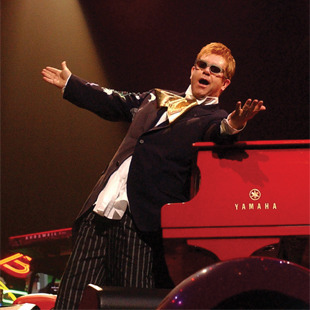 Playing on a million dollar piano at the Caesar Palace in Las Vegas, performing in the biggest Rock music festival in Rio, Elton John is an amazing performer and isn't done surprising us. Rumor has it, he is now planning on making a movie about himself. Elton John and his band will be on a national tour for about 2 weeks.